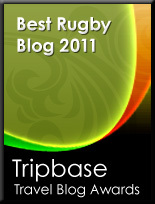 TOTAL FLANKER...a rugby blog: Volcano dormant? There's plenty of paper talk that Tonga are planning to call up Gloucester's Lesley "The Volcano" Vainikolo and unleash him on England on Friday night. Fortunately (and this is purely from an England perspective) the big Tongan-born winger suffered a neck injury playing for his club against Saracens yesterday and, while it's not thought to be serious, I would guess it probably rules him out for the weekend. More interestingly, Vainikolo (who has represented New Zealand at Rugby League) is qualified to play for England on residency grounds and has expressed an interest in doing so. "My ambition is to play for England down the line," he has apparently said, "but I am also qualified for Tonga, so it's a question of whoever comes first." In which case, if he does turn out to be fit and available, perhaps there's a case for Rob Andrew delivering a swift kick to the shins of the ineffectual Mark Cueto before calling The Volcano into the England squad?